Perceptive Things™ reduces costs by boosting incident response times within multi-family buildings. In 2016, 45% of all paid insurance losses were for water damage from plumbing leaks, totaling over $9 Billion, more than any other type of claim. Our mission is to eliminate damage from similar incidents in your building. Perceptive Things provides immediate notification of incidents, improving your staff's responsiveness, all at a fraction of the cost of custom "central station" monitoring systems. Perceptive Things protects residential properties from damaging incidents, such as water leaks, via wireless battery-powered sensors installed within apartments. The sensors trigger instant notifications to property managers and tenants, expediting response times in order to mitigate damage and eliminate losses. Contrary to consumer smart home sensing products, our hardware and software platform is designed and optimized specifically for multi-family buildings and property management professionals. 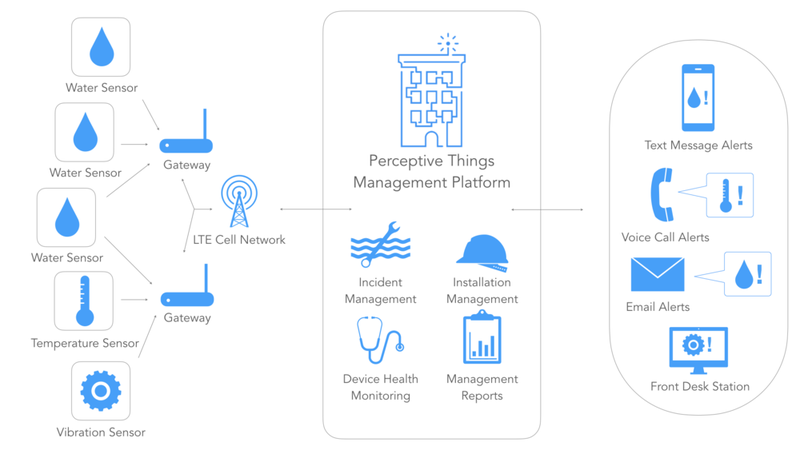 Perceptive Things uses a secure low power 915 MHz wireless network, bridged to the Internet over LTE, to communicate directly with our monitoring platform. Our equipment never needs to communicate over building-wide WiFi or Ethernet networks, providing an extra layer of security for you and your tenants. Typical buildings only require one or two wall-mounted gateway appliances, which can be installed non-invasively, needing only A/C power. More detailed information can be found on our Technology page.